75th and Sedgwick: Hello, Weekend? Can you get here already? Thanks. Hello, Weekend? Can you get here already? Thanks. The nursery makes me wanna say "eeeeeeeeeeeeeek!" with excitement. I can't wait to snuggle up with lil' Thunder in that bright red rocker. Also, that canvas makes me wanna paint every quote I've every loved. 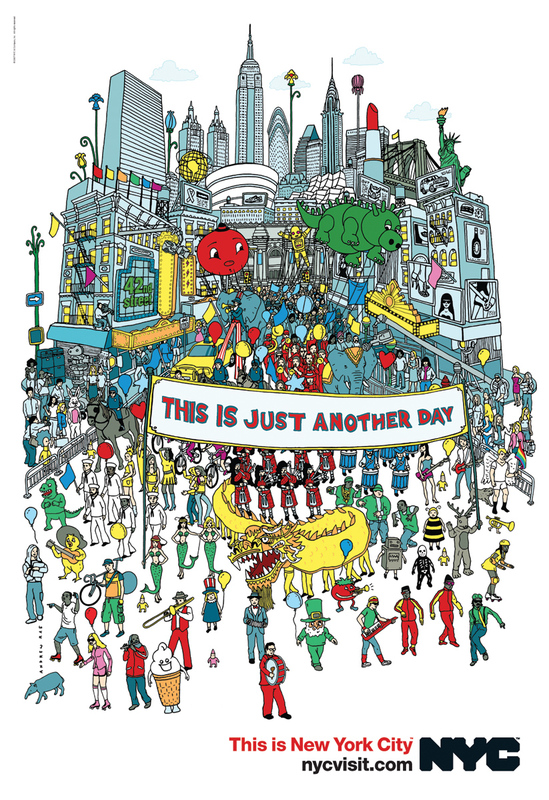 c.2007 NYC Tourism Campaign Poster. Source. I remember visiting NYC several times as a kid, and it definitely felt a lot like the picture above! But I still constantly wonder about what it would be like to be a kid in NYC now that I live here. This weekend I get a little glimpse. I think it's gonna be awesome. I've got a million and one things I want to do, and I know that we won't get to them all. But most of all, I seriously can't wait to give my nephew the biggest squeeze ever! Sorry, I will go on a squealing break now that this post is over. Promise. PS: The New York Magazine Fashion Issue covers (and inside stories) are making me so, so happy this week. Go pick up a copy! ahh eek is right! a little friend visiting?! you guys will have so much fun! can't wait to hear about all your adventures in the city! PS I too now want to put every quote I love on canvas - love the nursery!